I am 100% committed to the happiness and welfare of my clients. In order to best meet their specific needs, I listen carefully and customize everything from my services to our home search or marketing process to specifically meet the goals of every client. Everyone is different and after 18 years in real estate, I’ve learned how to work best with First Time Home Buyers, First Time Home Sellers, Seniors and those relocating into or out of this area. Throughout my career, I’ve earned educational designations that best equip me to meet various client needs. These include the ABR (Accredited Buyer Representative), GRI (Graduate, REALTOR Institute) and CRRS (Certified Residential Relocation Specialist). I was born and raised and have raised my family throughout the Triangle area. 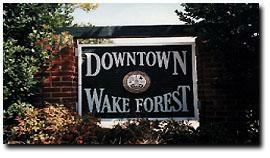 I grew up in Durham but have made my home in Wake Forest since 1969. My roots here are very deep and I love welcoming newcomers to this area! My knowledge of the entire area allows me to best assist clients in not only finding the right home for them but more broadly, the best neighborhood and community for them as well. As a Triangle native, I’m knowledgeable of the entire area but I specialize in the Wake Forest, Youngsville, Rolesville and North Raleigh communities. Give me a call when you’re ready to discuss your real estate needs in this area. I’ll be happy to show you around the lovely and historic downtown of Wake Forest where you can find the best hot dogs at Shorty’s or check out area parks and museums throughout the Triangle. Whether you’re looking to buy or sell, Your Home is Where My Heart Is and I’d love to be of assistance to you. We want to thank you for providing outstanding service in managing the sale of our Julie Ann home. We were very pleased at the timeliness in which you posted the listing and particularly the attention to detail that allowed such a phenomenal response time from the listing to receiving an off er to buy the property. “Thank you for helping us sell our investment home. I appreciate your timely responses to my texts--even though NC is 3 hours ahead of CA. You took good care of us. By making sure the heat remained on, the water pipes did not break even though it was below 20 degrees F. Hence, we were spared the cost plumbing-related repairs. You took responsibility as if it were your own property. In addition, you helped us navigate the transfer of utilities into our name after our renter left; and made sure the financially responsibility ended for us and began with the buyers at closing. You conducted yourself in a professional and honest way at all times. You hounded me at the right time and in the right way-so I could get the closing documents signed, notarized, and overnight-ed by UPS in time for the attorney and buyers to complete today's purchase. Thank you for insuring that our closing check is accurate and timely. Believe it or not, you brought us closer to experiencing financial freedom. We realize that this is achieved in increments. This sale is a major step. My wife and I are relieved to be free of the burdensome financial obligations of: mortgage, property management and HOA fees, home and appliance insurance, repairs and general maintenance. I am not sure exactly where to start to tell you how wonderful she is. We met Cindy when our original agent had surgery and was unable to continue helping us in the time frame that we needed. Cindy is on top of her game, extremely knowledgeable, savvy about the market and dedicated to her clients. Her instincts for people, product, offers, counter-offers etc was spot on. The guidance that she provided for my husband and me was more than we could have ever asked of anyone. There is one thing however, that truly differentiates Cindy, I believe she genuinely cares about her clients, their futures, their wants and needs. This process has been stressful, tiring, bittersweet and sometimes just down right overwhelming for me. Somehow Cindy always knew when I needed a boost or a friend because she would send me the kindest emails checking on me and our progress with moving etc. She was truly a rock and I feel blessed to have her for an agent. I am not sure that words could ever convey how grateful I am for Cindy’s leadership. I am happy to say that I not only have a great Realtor but also an amazing friend. I will not hesitate to recommend Cindy to anyone that is looking for an agent. I just really wanted you to know what an exceptional asset you have in Cindy and I hope you will let her know that I have shared this information with you. I vote Cindy for Agent of the Year! "You were able to sell our home in less than two weeks that two realtors before you were not able to do. You were very thorough in letting us know the facts of selling our home in today's market. You kept up with us and letting us know where we were in the selling of our home. Having not moved in twenty-five years it was a blessing to have Cindy helping us through each and every step. Our neighbors stated that they saw more activity at our home during the time it was in your hands then under any previous realtor. Thank you again and take care!" "My husband, Mike and I want to let you know how thrilled we are with Cindy Estes. We lived in Washington State but Mike needed to be out here in the Raleigh area for business proposes so we needed to look for a house. We were already going to be out here anyway and hoped that we would have time to look for a house and we did . We contacted Coldwell Banker and ended up with Cindy Estes on a Friday. Cindy was wonderful, she dropped everything and showed us 19 houses in two and a half days. Cindy asked the right questions that only a great, experienced Realtor would know to ask, also her local knowledge and perspective helped us make decisions. Cindy really listened to our list of wants and desires and because of that we have a house of our dreams that we are thrilled with. We wanted you to know how wonderful she is and that if I were going to send someone to a particular realtor Cindy would be the person." "We had interviewed a number of agents and we were not happy with their presentations or preparedness. When Cindy entered our home, and said a few words to us, we just knew! She presented a professional and knowledgeable presentation. She listens and respects your thoughts and ideas. Above all is her honesty and integrity. Cindy made selling our home easy. She was always accessible, returning phone calls in a timely manner. After selling our home, we have become friends. I highly recommend Cindy Estes! Her word is her bond."